The voicemail is an extension that can be set up on Ozeki Phone System XE. It records missed calls defined by dial plan rules. If a call is forwarded to the voicemail, it will be recorded. If you are interested in the content of your voicemail, then you only need to call the voicemail extension and listen to your voicemail. The voicemail extension knows who called it by the phone number of the caller so it can provide you your voicemails. If you would like to give other people the opportunity to leave a message to you, even if you can not reach the phone. You can get your voicemails in e-mail too. If you have a registered e-mail address in Ozeki Phone System XE then an e-mail will be sent to you with an attachment containing your voicemails. 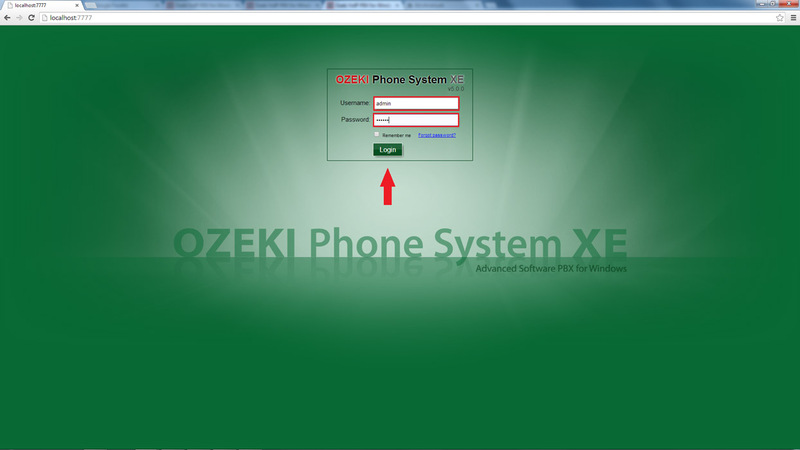 Login to Ozeki Phone System XE (Figure 1). Type in your username and password then press login. 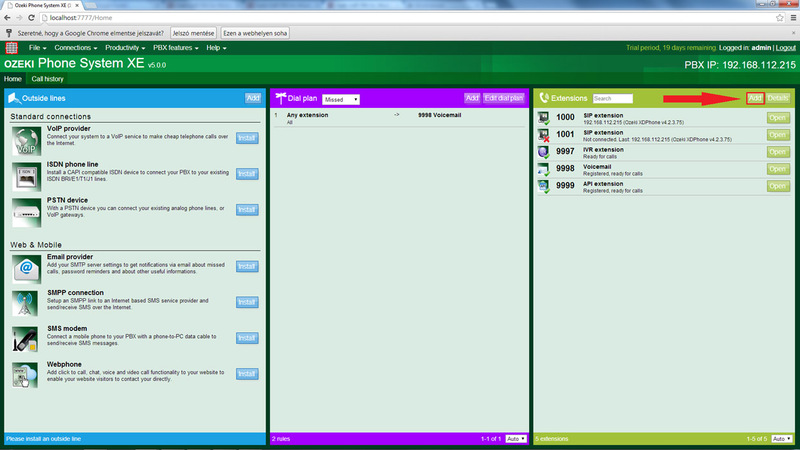 On the right side of the screen you will see a green bordered box called Extensions. Click ’Add’ (Figure 2). You need to register a Voicemail extension. If a call can not be answered you can forward it to this extension to record what the caller has to say. By calling this extension the caller can listen to his/her voicemails. On the right half of the screen you will see a ’Voicemail’ label. Click the ’Install’ button next to it (Figure 3). On the screen of the Voicemail Installation you can see two labels: General and Advanced. On the General label there are the options of settings, file saving and greeting settings. You need to type in the extension number you want the voicemail to have. Please provide a local directory where you want the voicemails to be saved. Below this you can set the minimum record length, so for example if a voicemail is shorter then 2 seconds it won’t be saved. You can also set the format of the voicemail: you can save them in mp3 or wav format. If you put a tick next to the 'Send in e-mail' option it will send the voicemail as an e-mail attachment to the e-mail address belonging to the user of the extension. You can add users to any extension easily. Just open the extension and click on the configure option. Now you only need to choose which user you would like to add to this extension. If there is no e-mail address registered to the user of the extension then the voicemail will not be sent out as an e-mail. If you would like to know more about the user configuration please visit this page. And it is important that you need to install an Email provider to reach e-mail services. Without it you can't send the record to your e-mail address. 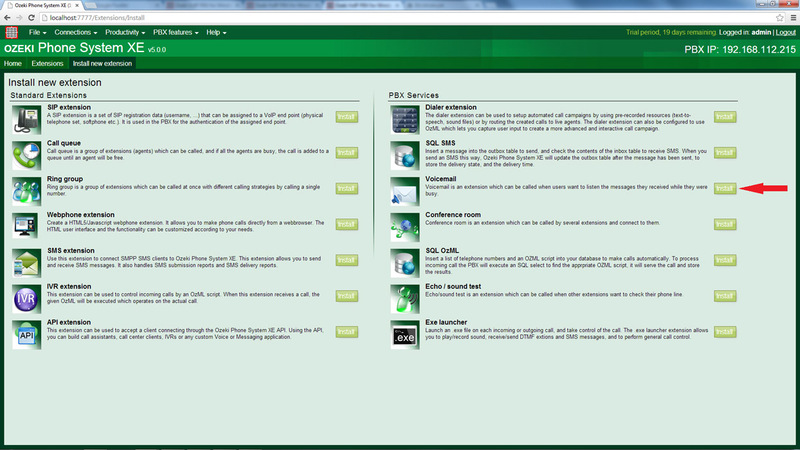 For more information please visit the How to setup e-mail messaging in Ozeki Phone System XE page. If you click on the Advanced label there are two options: you can set the behaviour of the recording and the behaviour of the play. The recording behaviour specifies how the voicemail reacts when someone wants to leave a message and the play behaviour specifies how the voicemail reacts when someone wants to listen to the messages left on the voicemail. You can choose the Default behaviour option or select the Custom behaviour to customize the OzML Code of them. You can find more information about the OzML in the OzML reference book. In the Record OzML code after a greeting message there will be two seconds of delay and a beep. You can optimize your recording with adding settings like the record path, the format of the record, which could be mp3 or wav, the inactivity is the period when voice is not detected for this amount of seconds and the record command will be finished, and you can specify the finish digits. When one of these digits are pressed, the record command will be interrupted. Important to mention this is just the default behaviour and the default OzML code, there is many other option to format your voicemail recording. If you press the button 1, you can listen to your new messages. With the ForEach loop you can go through your messages, and you will be informed when your voicemail has been created and who was the caller. 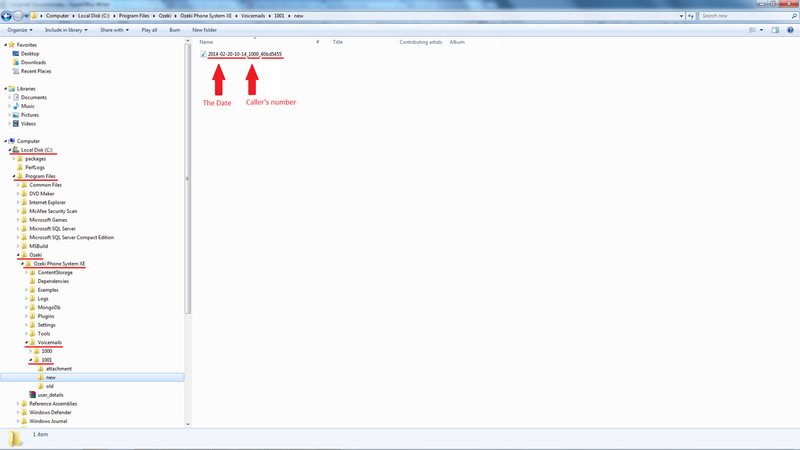 Then the system will play the record and move this file into the old messages directory. That will be repeating until you have not listened to your last voicemail. If you press the button 2, you can listen to your old messages and you can delete them with the 'DeleteFile' command. 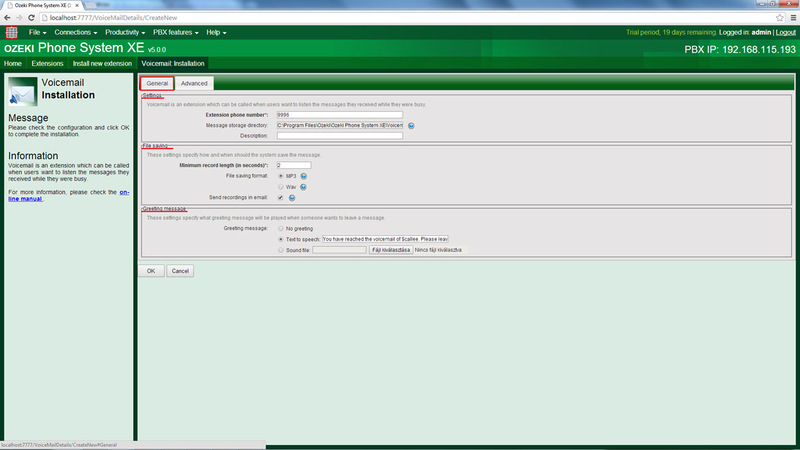 And finally if you press the button 3, you can record your new gretting message which will be saved. But you can setup many other option if you want to. If you call your own Voicemail extension, you can listen to your voicemails, in case you received any. When the call comes from someone else to your Voicemail extension, the caller will be able to leave a message for you. You have set up a dial plan to record a voicemail when the dialled number is an extension (for example 1001) and it is busy or it is reachless. So call 1001 to test the voicemail. Let us pick up the transmitter of 1001 and put it on the table to make it busy. Call 1001 from another extension and check if the voicemail is saved. I made a test call from 1000 to 1001, and 1001 is transferred to the voicemail. If I hang up the 1001 when connected to the voicemail extension, the voicemail is saved at 'Voicemails' folder in Ozeki Phone System XE/Voicemail/1000/new. You can set the save folder of the voicemail by configuring it. 1001 is the voicemails recipient. 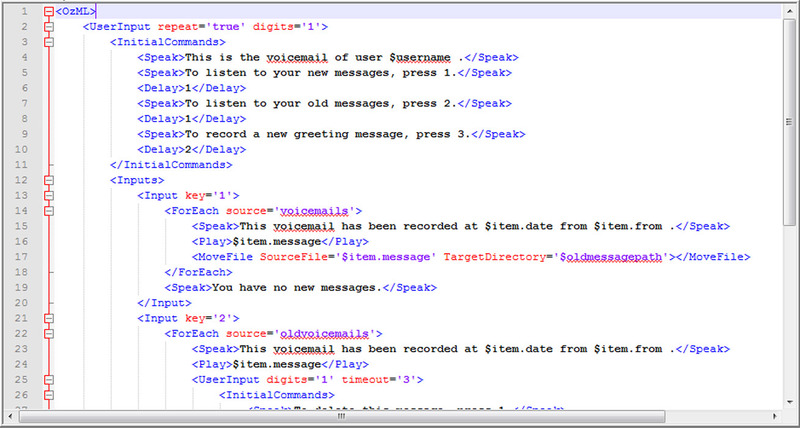 The sender and the time are contained in the voicemails file name. Congratulations! Now your voicemail is fully functional. With a voicemail you can record specific calls determined by the dial plan rules. By dialling the voicemail manually you can listen to your voicemails. The voicemail is an extension in Ozeki Phone System XE, the number of the extension is the phone number of the voicemail.